People sure do seem to really like the gold cutlery and it is only getting more and more popular over the last couple of years. This is a setting for one person that consists of a knife, fork, soup spoon and teaspoon. It is made of 18/10 stainless steel but you want might to be careful with the dishwasher as it could lose some color. It seems they had some problem with the black but now use a powder coat that should hold of a lot better. 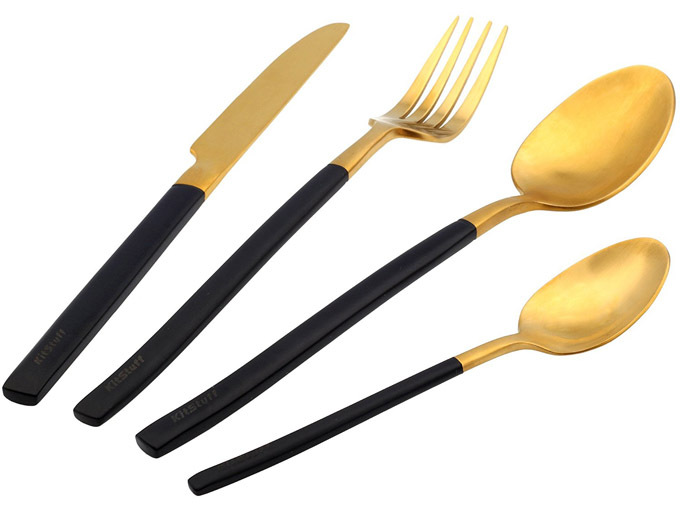 I must say the black and gold design is very striking and will make an impression on your diners with this flatware. ← How Cutlery is made!